Editor’s Note: Administering a website like this occasionally makes editors privy to some exotic and intriguing correspondence. In light of the particularly dark nature of some letters we have stumbled upon—we can’t reveal exactly how—we thought it our duty to share this series of missives. We appear to be in possession of only one side of the exchange of letters—from a nephew to his uncle. The nephew’s name is Ichabod and his uncle’s name Apollyon, who seems to be in an advisory position of some sort. It’s not our intent to demonize anyone by divulging what we have seen, but we feel we are performing an important service by bringing this devilishly cunning correspondence to light. Here is the twenty-seventh letter we were given. Your last letter put me in mind of the great opportunities open to us in exploiting the spiritual hazards in the way of those who feel called to full-time ministry in the Enemy’s service. The first hazard lies at the outset, in encouraging young people to consider whether “God” has called them to a life of working for and being supported by the church. Adolescents and young adults in a religious setting are usually by inclination idealistic and prone to rash and romantic decisions. That means that they can also be very easily disillusioned when they take the plunge into "full time service"; or else they can fall into delicious self–righteousness because of the sacrifices they are making. 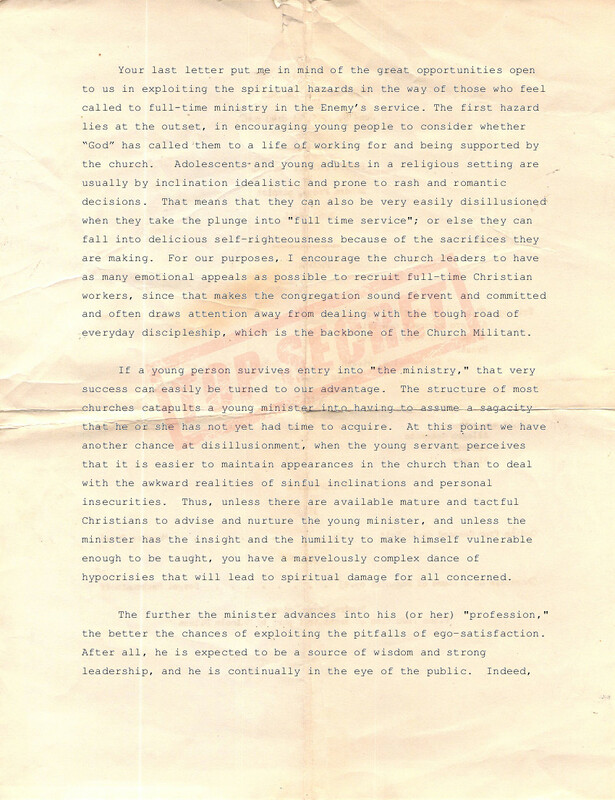 For our purposes, I encourage the church leaders to have as many emotional appeals as possible to recruit full–time Christian workers, since that makes the congregation sound fervent and committed and often draws attention away from dealing with the tough road of everyday discipleship, which is the backbone of the Church Militant. If a young person survives entry into "the ministry," that very success can easily be turned to our advantage. The structure of most churches catapults a young minister into having to assume a sagacity that he or she has not yet had time to acquire. At this point we have another chance at disillusionment, when the young servant perceives that it is easier to maintain appearances in the church than to deal with the awkward realities of sinful inclinations and personal insecurities. Thus, unless there are available mature and tactful Christians to advise and nurture the young minister, and unless the minister has the insight and the humility to make himself vulnerable enough to be taught, you have a marvelously complex dance of hypocrisies that will lead to spiritual damage for all concerned. The further the minister advances into his (or her) "profession," the better the chances of exploiting the pitfalls of ego–satisfaction. After all, he is expected to be a source of wisdom and strong leadership, and he is continually in the eye of the public. Indeed, he has to have a strong ego to withstand the criticism and perverse resistance that we stir up in the congregation. The key is to make him rely on himself, rather than on the Enemy, to handle all this ego–threatening opposition. Once his chief object becomes self–preservation, we have him where we want him. We have to keep ministers away from letting early idealism develop into a full–blown rejection of worldly common sense about the exercise of power and influence. We've lost them if they start truly serving instead of trying to control; speaking what the Enemy wants them to say, rather than what people want to hear; and losing face or dignity, if necessary, to make people aware of the "glory of God." Since these non–worldly methods seem on the face of them to be counter–productive to what most people consider success, it is usually not too difficult to dissuade ministers from employing them. With all these opportunities for diverting even the well–intentioned people who go into the ministry, is it any surprise that so many fall by the wayside, while still others continue in their path primarily to the benefit of our Infernal Father? Nevertheless, the Enemy enables far too many to survive and to aid His kingdom, even in the face of their inadequacies. The heaven of it (pardon my language) is that the more they realize their weaknesses, the stronger He seems to make them. How can we prevail in the face of such perverse countermanding of justice and common sense? We must concentrate more on making people too proud to accept this humiliating mercy! Image: "Old school spam" by G M. CC license.